In the 1990s, leading experts, politicians, public officials, business leaders and journalists predicted that the internet would transform the world. The internet would revolutionise the organisation of business, and lead to a surge of prosperity. It would inaugurate a new era of cultural democracy in which sovereign users – later dubbed 'prosumers' – would call the shots, and the old media leviathans would decay and die. It would rejuvenate democracy - in some versions by enabling direct e-government through popular referendums. All over the world, the weak and marginal would be empowered, leading to the fall of autocrats and the reordering of power relations. More generally, the global medium of the internet would shrink the universe, promote dialogue between nations, and foster global understanding. In brief, the internet would be an unstoppable force: like the invention of print and gunpowder, it would change society permanently and irrevocably. These arguments were mostly inferences derived from the internet’s technology. It was assumed that the distinctive technological attributes of the internet – its interactivity, global reach, cheapness, speed, networking facility, storage capacity, and alleged uncontrollability – would change the world beyond all recognition. Underlying these predictions was the assumption that the internet’s technology would reconfigure all environments. Internet-centrism, a belief that the internet is the alpha and omega of technologies, an agency that overrides all obstacles, and has the power to determine outcomes, lies at the heart of most of these prophecies. But as pronouncements about the internet’s positive impact became more concrete and assured, there developed a backlash. A straw in the wind was the apostasy of MIT guru Sherry Turkle. In 1995, she celebrated anonymous online encounters between people assuming false identities on the grounds that they could extend imaginative insight into the ‘other’, and forge more emancipated sensibilities (Turkle 1995). Sixteen years later, she changed tack. Online communication, she lamented in 2011, could be shallow and addictive, and get in the way of developing richer, more fulfilling interpersonal relationships (Turkle 2011). Another apostate was the Belarus activist, Evgeny Morozov, who disavowed his former belief that the internet would undermine authoritarian regimes. There were also others whose initial, more guarded hope in the emancipatory power of the internet turned to outright scepticism. Typical of this latter group is John Foster and Robert McChesney who wrote in 2011 that ‘the enormous potential of the Internet … has vaporized in a couple of decades’. We are thus faced with a baffling contradiction of testimony. Most informed commentators view the internet as a transforming technology. Their predictions are now seemingly being confirmed by events, as in the Middle East. However, there is an unsettling minority who confidently decry the majority view as a delusion. During the 1990s, there was a broad consensus that the internet would promote greater global understanding. ‘The internet’, declared the Republican politician Vern Ehlers (1995), ‘will create a community of informed, interacting, and tolerant world citizens’. The internet, concurred Bulashova and Cole (1995), offers ‘a tremendous “peace dividend” resulting from improved communications with and improved knowledge of other people, countries and cultures’. One key reason for this, argues the writer Harley Hahn (1993), is not just that the internet is a global medium but also that it offers greater opportunity for ordinary people to communicate with each other than do traditional media. ‘I see the Net’, he concludes, ‘as being our best hope…. for the world finally starting to become a global community and everybody just getting along with everyone else’. Another reason for optimism, according to numerous commentators such as Frances Cairncross, is that the internet is less subject to national state censorship than traditional media, and is thus better able to host a free, unconstrained global discourse between citizens. These themes – the internet’s international scale, user participation, and freedom – continued to be invoked in the 2000s as grounds for thinking that the internet is bonding the world in growing amity. The central weakness of all this theorising is that it extrapolates consequences from the technology of the internet. What this overlooks is the multiple ways in which the wider context of society limits – and even negates - the contribution that the internet makes to global harmony and understanding. First, the world is very unequal, and this limits participation in an internet-mediated global dialogue. The richest 2 per cent of adults in the world own more than half of global household wealth, with the richest 1 per cent of adults alone possessing 40 per cent of global assets in 2000 (Davies et al 2006). Adults making up the bottom half of the world population own barely 1 per cent of global wealth. Davies et al. note that wealth is concentrated in North America, Europe and high income Asia-Pacific countries; people in these countries hold almost 90 per cent of total world wealth. These rich countries have very high internet access: 77 per cent of North Americans have internet access, 61 per cent in Oceania / Australia and 58 per cent of Europeans (Internet World Stats, 2010a). There are many developing countries that have internet penetration rates that are less than 1/100 of those in wealthy countries (Wunnava and Leiter, 2009: 413). This skews the composition of the internet community. The total proportion of population in 2011 who are internet users is 30 per cent (Internet World Stats 2011a). So if the internet is bringing the world together, it is primarily the affluent who are being brought into communion with each other. Most of the world’s poor are not part of this magic circle of ‘mutual understanding’. Second, the world is divided by language. Most people can only speak one language, and so cannot comprehend literally what foreigners say. The nearest thing to a shared online language is English which, according to the ITU, only 15% of the world’s population understands. The role of the internet in bringing people together is thus hampered by mutual incomprehension. Third, language is a medium of power. Those writing or speaking in English can reach, in relative terms, a large global public. By contrast, those conversing in Arabic are only able to communicate potentially to 3 per cent of internet users (Internet World Stats, 2010b); and those communicating in Marathi potentially reach a percentage of internet users so small as to be measurable only in decimal points. Who gets to be heard online in the global community often depends on their mother tongue. Fourth, the world is divided by conflicts of interest and values. These can find expression in websites that foment – rather than assuage – animosity. Thus, there has been a proliferation of race hate websites. The Raymond Franklin list of such sites runs to 170 pages. Some of these sites have a large base: Stormfront, one of the earliest white-only US websites, had 52,566 active users in 2005 (Daniels 2008: 134). Detailed studies of hate sites conclude that they maintain and extend racial hatred in a variety of ways (Back 2011; Perry and Olsson 2009; Gerstenfeld et al. 2003). They can foster a sense of collective identity, reassuring militant racists that they are not alone. Some foster a sense of community not only through features like an ‘Aryan Dating Page’ but also through more conventional content such as forums discussing health, fitness and homemaking. The more sophisticated are adept at targeting children and young people by offering, for example, online games and practical help. Race hate groups increasingly use the internet to develop international networks of support in which ideas and information are shared. And of course their staple content is designed to promote fear and hatred, typified by warnings of the ‘demographic time bomb’ of alien procreation in their midst. These ‘white fortresses’ of cyberspace promote not just disharmony. There is a relationship between racist discourse and racist violence (Akdeniz 2009). This illustrates one central point: the internet can spew out hatred, foster misunderstanding and perpetuate animosity. Because the internet is both international and interactive, this does not mean necessarily that it encourages only ‘sweetness and light’. Fifth, national and localist cultures are still strongly embedded in much of society (in contrast to the cosmopolitan temper of academic life). These cultures are supported by the organization and values of traditional news media throughout the world. Thus, news media tend to concentrate on domestic news. For example, in 2007 American network TV news devoted only 20% of its time to foreign news, while even its counterparts in two internationalist Nordic countries allocated just 30% (Curran et al 2009). Insular news values also shape the content of the press in these and other countries (Curran et al 2010: Aalberg and Curran 2011). Above all, nation-centered cultures shape the content of internet-mediated news. A study of the leading news website in nine nations, across four continents, in 2010 found that these publish mainly national news, and are only marginally more internationalist than leading television news programmes. Sixth, national governments seek everywhere to manage or control their media systems. In particular, authoritarian regimes have developed new ways of censoring online communication, principally through licensing internet service providers and websites, through filtering out URLs on an official blacklist, through software that monitors internet content and use, and through creating a general climate intimidation and fear. As a consequence, global internet discourse is distorted by state intimidation and censorship. Seventh, people who actively participate in politics can be untypical of the general population, and this can influence the nature of online discourse. Smith et al 2009 discovered that, in the US, the advantaged tend to be the most active in politics, and this is reproduced in online activism. Similarly, Di Gennaro and Dutton(2006) found that in Britain the politically active tend to be drawn from the higher socio-economic groups, the more highly educated and older people. Those engaged in political online participation were even more skewed towards the affluent and highly educated, though they were more often younger. Di Gennaro and Dutton’s conclusion is that the internet seems to be promoting political exclusion rather than inclusion. In short, the idea that cyberspace is a free, open space where people from different backgrounds and nations can commune with each other, and build a more deliberative, tolerant and empowered world overlooks a number of things. The world is unequal and mutually uncomprehending (in a literal sense); it is torn asunder by conflicting values and interests; it is subdivided by deeply embedded national and local cultures (and other nodes of identity such as religion and ethnicity); and some countries are ruled by authoritarian regimes. These different aspects of the real world penetrate cyberspace producing a ruined tower of Babel with multiple languages, hate websites, nationalist discourses, censored speech and over-representation of the advantaged. Yet there are forces of a different kind influencing the development of society. Increasing migration, cheap travel, mass tourism, global market integration and the globalization of entertainment have encouraged an increased sense of transnational connection. Some of these developments find support in the internet. YouTube showcases shared experience, music and humour from around the world that promotes a ‘we-feeling’. Here is u an excerpt from YouTube that is funny in any language, overcoming the deadening effect of subtitles. The internet also facilitates the rapid global distribution of arresting images that strengthen a sense of solidarity with beleaguered groups, whether these are earthquake victims or protesters facing repression in distant lands. The internet has the potential to assist the building of a more cohesive, understanding and fairer world. But the mainspring of change will come from society, not the microchip. The uprisings in the Middle East are in part a testimony to the power of the internet, mobile phone and satellite TV to mobilize dissent, and to win support from outside the Middle East. That said, these uprisings also have deep underlying causes: disappointed expectations following rapid educational advance, high youth unemployment, rising food prices, unpopular neo-liberal policies, resentment against crony capitalism and authoritarian rule, and in some cases tribal and religious enmity. These uprisings were prefigured by strikes and protests in Egypt, Tunisia and elsewhere extending back to the 1980s. Indeed, what is striking is that out of the six actively ‘insurgent’ countries (Tunisia, Egypt, Libya, Bahraain, Syria and Yemen) only Bahrain features in the top five rankings of Arab countries for Facebook penetration and internet use. This underlines the point that it was not communications technology that caused these uprisings, but deep-seated societal factors, since other Arab countries with much higher internet penetrations rates like Saudi Arabia and the UAE did not turn on their dictators. Let us turn now to predictions about how the internet would affect journalism. The internet, according to Rupert Murdoch, is democratising journalism. ‘Power is moving away’, he declares, ‘from the old elite in our industry – the editors, the chief executives and, let’s face it, the proprietors’, and is being transferred to bloggers, social networks and consumers downloading from the web (Murdoch 2006). This view is echoed by the leading British conservative blogger, Guido Fawkes, who proclaimed that ‘the days of media conglomerates determining the news in a top-down Fordist fashion are over... ‘ The radical academic lawyer, Yochai Benkler (2006), concurs, arguing that a monopolistic industrial model of journalism is giving way to a pluralistic networked model based on profit and non-profit, individual and organised journalistic practices. The radical press historian, John Nerone , goes further, pronouncing the ancient regime to be a thing of the past. ‘The biggest thing to lament about the death of the old order [of journalism]’, he chortles, ‘is that it is not there for us to piss on any more’ (Nerone 2009: 355). Numerous commentators, drawn from the left as well as the right, and including news industry leaders, citizen journalists and academic experts, have reached the same conclusion: the internet is bringing to an end the era of media moguls and conglomerate control of journalism. The second related theme of this euphoric commentary is that the internet will lead to the reinvention of journalism in a better form. The internet will be ‘journalism’s ultimate liberation’, according to Philip Elmer-Dewitt (1994) because ‘anyone with a computer and a modem can be his own reporter, editor and publisher – spreading news and views to millions of readers around the world’. One version of this vision sees traditional media being largely displaced by citizen journalists. An alternative version sees professional journalists working in tandem with enthusiastic volunteers to produce a reinvigorated form of journalism (e.g. Beckett 2008; Deuze 2009). In brief, we are told that the internet will bury the old order of journalism, and give rise to its reinvention in a better form. The first reason for questioning this is that television is still the dominant news source. Thus in all six countries - Britain, France, Germany, Italy, United States and Japan – surveyed in 2010, more respondents said that they relied on television rather than the internet as the main source of news about their country (Ofcom 2010b). More importantly, leading news organisations have colonised cyberspace. To pre-empt competition, they set up satellite news websites. These quickly became dominant because they were heavily cross-subsidised; and exploited the newsgathering resources and established reputations of their powerful parent companies. Thus, Pew (2011) found that in 2010 80% of the internet traffic to news and information sites is concentrated on the top 7% of sites. The majority of these top sites (67%) are controlled by dominant news organisations from the pre-internet era. Another 13% are accounted for by content aggregators. Only 14% of these top sites are online-only operations that produce mostly original reportorial content. In other words, the rise of the internet has not undermined leading news organisations. On the contrary, it has enabled them to extend their hegemony across technologies. In concrete terms, this means that the ten most visited newspaper websites in the world in 2010/1 included only one online independent (Huffington Post): the remaining nine were leading news organisations, like the New York Times and Guardian, from the pre-internet era (Guardian 2011). The top ten news websites in the US in March 2011 included only one online independent (again the Huffington Post): the remainder were four leading TV organisations, three leading newspapers and two content aggregators (Moos 2011). In Britain, there was no online independent among the top ten news sites in 2011: all the top spots were filled by leading television and newspaper organisations and content aggregators (Nielsen 2011). Content aggregators do not usually give prominence to alternative news sources. Thus Joanna Redden and Tamara Witschge (2010) examined Google’s and Yahoo’s listing of content, over time, in relation to five major public affairs issues, only to find that ‘no alternative news sites were returned in the first page of search results’. Nor has the internet connected the legion of bloggers to a mass audience. In Britain, for instance, 79 per cent of internet users in 2008 had not read a single blog during the previous three months (ONS 2008). Most bloggers lack the time to investigate stories. They are amateurs, who need their regular day job to pay their way (Couldry 2010). This reduces their ability to build a large audience. But if the old order is still often in control, has journalism got better? One consequence of the rise of the internet has been to draw advertising away from old media and, to a lesser extent, from news production in general. The total number of journalists employed in the US declined by 26% between 2000 and 2009 (Pew 2010), while those employed in the UK’s ‘mainstream journalism corps’ shrunk by between 27% and 33% between 2001 and 2010 (Nel 2010). News budgets have also been cut, with the result that even the large metropolitan dailies and television network news in the US have been forced to economise on time-consuming investigative journalism and high-cost foreign journalism. A major study of British journalism also concludes that a more profound and pervasive process of deterioration is taking place in marked contrast to hyped predictions of regeneration (Fenton 2010; Lee-Wright et al. 2011). It found that fewer journalists are being expected to produce more content, as a consequence of newsroom redundancies, the integration of online and offline news production, and the need to update stories in a 24-hour news cycle. This is encouraging journalists to rely more on tried-and-tested news sources as a way of boosting output. It is also fostering the lifting of stories from rivals’ websites as a way of increasing productivity, even to the extent of using the same news frames, quotes and pictures. Depleted resources are contributing in general to increased reliance on scissors-and-paste, deskbound journalism. To judge from an Argentinean study, a very similar trend towards imitative, office-centred journalism is also taking place elsewhere (Boczkowski 2009). While some journalistic green shoots have appeared, they have been mostly sickly. Independent online news ventures have found it difficult to build a subscription base because the public has become accustomed to having free web content. And because these online independents have generally attracted small audiences, they have low advertising returns. A 2009 Pew Research Center study in the US concluded that ‘...despite enthusiasm and good work, few if any of these are profitable or even self-financing”. Similarly, a 2009 Columbia Journalism Review study concluded that “it is unlikely that any but the smallest of these [web-based] news organisations can be supported primarily by existing online revenue” (Downie and Schudson 2010). Often with skeletal resources, their most pressing priority has usually been to stay alive. In brief, the dominant news organisations have entrenched their ascendancy because they have gained a commanding position in both the offline and online production and consumption of news. In addition, the rise of the internet as an advertising medium has led to budget cuts, increased time pressure on journalists and, sometimes, falling quality in mainstream journalism. This has not been offset by new independent news start-ups because they have been mostly too small and with too little firepower to ride to the rescue. This needs to be qualified by recognising that there are geographical variations. Thus, in South Korea the citizen newspaper website, OhmyNews with a core staff supported by a large number of volunteer reporters, built a mass audience in the early 2000s. However, the website’s take-off was sustained by a generational protest against cultural conformism, and a political protest against government-corporate cronyism. When the wind behind the website subsided later in the decade, OhmyNews ran into difficulties. And its attempt to establish a similar venture in the less fertile soil of Japan was a flop. Between 1995 and 2000, it was widely claimed that the internet would generate wealth and prosperity for all. Typifying this prediction was a long article in Wired, the bible of the American internet community, written by the magazine’s editor, Kevin Kelly in 1999. Its title and lead-in set the article’s tone: ‘The Roaring Zeros: The good news is, you’ll be a millionaire soon. The bad news is, so will everybody else’. This good news was widely reported across both sides of the Atlantic, though in not quite such ecstatic terms. It was underpinned by seemingly authoritative reports that in the words of Business Week: ‘We have entered the Age of the Internet’…….. The result: an explosion of economic and productivity growth first in the US, with the rest of the world soon to follow’ (emphasis added). Central to these predictions is the idea that the internet and digital communication is giving rise to the ‘New Economy’. While this concept is amorphous and mutable, it usually invokes certain themes. The internet provides, we are told, a new, more efficient means of connecting suppliers, producers and consumers that is increasing productivity and growth. The internet is a disruptive technology that is generating a Schumpeterian wave of innovation. And it is leading to the growth of a new information economy that will replace heavy industry as the main source of wealth in de-industrialising, western societies. At the heart of this theorising is a mystical core. This proclaims that the internet is changing the terms of competition by establishing a level playing field between corporate giants and new start-ups. The internet is consequently renewing the dynamism of the market, and unleashing a whirlwind force of business creativity. By bypassing established retail intermediaries, the internet is carving out new market opportunities. It is lowering costs, and enabling low-volume producers to satisfy neglected niche demand in a global market. The internet also favours, we are informed, horizontal, flexible network enterprise able to respond rapidly to changes in market demand unlike heavy-footed, top-down, Fordist, giant corporations. The concept of the New Economy is often cloaked in specialist language. To understand its insights, it is essential to learn a new vocabulary: to distinguish between portal and vortal, to differentiate between internet, intranet and extranet, to assimilate buzz concepts like ‘click-and-mortar’ and ‘data-warehousing’, and to be familiar with endless acronyms like CRM (customer relationship management), VAN (value-added network), ERP (enterprise resource planning), OLTP (online transaction processing), and ETL (extract, transform and load). To be part of the novitiate who understands the future, it is first necessary to master a new catechism. But if this insider language is pushed to one side, it is possible to formulate certain cautious conclusions. The first is that the internet has indeed modified the nerve system of the economy, affecting the collection of data, the interactions between suppliers, producers and consumers, the configuration of markets, the volume and velocity of global financial transactions, and the nature of communication within business organisations, as well as giving rise to major corporations such as Google and Amazon, and the launch of new products and services. This said, the internet does not represent a complete rupture with the past since it was preceded by the widespread corporate use of computers, and by earlier electronic data interchange systems (like the telex and fax) (Bar and Simard 2002). The second conclusion is that the internet has not proved to be a geyser of wealth cascading down on investors and the general public. There was an enormous increase in the stock market value of internet companies between 1995 and 2000. But in the event, the internet gold mine proved to be made of fool’s gold. Most dot com start-ups that attracted heavy investment folded without ever making a profit, in some cases after burning through large quantities of money in less than two years (Cellan-Jones 2001). These losses were so severe that it tipped the US economy into recession in 2001. In the subsequent period, the internet did not prove to be a fount of wealth. Thus, a Harvard Business school study, using an employment income approach, concluded that the advertising-supported internet in America contributed approximately 2 per cent to GDP, or perhaps 3% if the internet’s indirect contribution to domestic economic activity is taken into account in 2008(Deighton and Quelch 2009). Similarly, it is estimated by a leading research team that business to consumer e-commerce in Europe accounted for 1.35% of GDP in 2007 (Eskelsen et al 2009). The third conclusion is that the internet has not, so far, revolutionised shopping. Even in countries where online shopping is widespread, it tends to be concentrated on a limited range of products and services. In 2007, online sales accounted for 7% of total sales turnover in the UK, and 4% in Europe (European Commission 2009). But this will almost certainly increase. The fourth, and much the most important, conclusion is that the internet has not created a level playing field between small and large enterprise. The belief that it would was the principal evangelical component of the ‘New Economy’ thesis, and lay at the heart of its conviction that the internet would generate a surge of innovation and growth. (6) This article of faith did not anticipate the difficulty that small and medium firms would continue to have in penetrating foreign markets. As it turned out, the usefulness of the internet as a tool for securing foreign market access was constrained by language, cultural knowledge, the quality of telecommunications infrastructures, and foreign computer skills (Chrysostome and Rosson 2004). More importantly, the New Economy thesis failed to take adequate account of the continuing economic advantage of corporate size. (7) Large corporations have bigger budgets, and greater access to capital, than small companies. They have economies of scale enabling lower unit costs of production; economies of scope based on the sharing of services and cross-promotion; and concentrations of expertise and resources that assist them to launch successful new products and services. They can seek to undermine under-resourced competition by temporarily lowering prices, and by exploiting their marketing and promotional advantage. In addition, they can try and ‘buy success’ by acquiring promising young companies – the standard strategy of conglomerates. This is why, in the internet age, large corporations continue to dominate leading market sectors, from car manufacture to grocery supermarkets. Indeed, in the leading economy (US), the number of manufacturing industries, in which the largest four companies accounted for at least 50% of shipment value, steadily increased between 1997 and 2007 (Foster et al 2011: chart 1). There was also a truly remarkable increase between 1997 and 2007, in the market share of the four largest firms in leading sectors of the US retail industries (Foster et al. 2001: table 1). To take just two examples, the big 4 computer and software stores’ share soared from 35% to 73%, while the share of the big 4 merchandising stores rose from 56% to 73%, during this period. More generally, the gross profits of the top 200 US corporations as a percentage of total gross profits in the US economy very sharply increased between 1995 and 2008 (Foster et al. 2011 chart 3). In brief, the triumph of the small business in the internet era never happened because competition remained unequal. Corporate Goliaths continued to squash commercial Davids, armed only with a virtual sling and pebble. This is not a novel insight. It is one that liberals after 1880 made when they discovered that the popular press did not become an autonomous instrument of rational and moral instruction, as they had hoped, but instead reflected the people who controlled and bought popular newspapers. This process of disenchantment is brilliantly illuminated by Mark Hampton. It led more sceptical but better informed commentators to de-capitalise the ‘Newspaper Press’. Perhaps we should do the same in relation to the Internet. 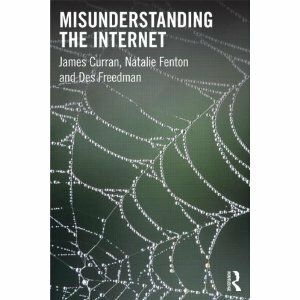 Misunderstanding the Internet, by James Curran, Natalie Fenton and Des Freedman, published by Routledge will be coming out in March 2012.